Hillary Clinton continues to lead Democratic presidential rival Sen. Bernie Sanders (I-Vt.) nationally, though her advantage has shrunk the past month, according to a new poll. Clinton is supported by 52 percent of Democrats and Democratic-leaning voters in the latest Monmouth University survey, down 7 points from the same poll in December. Sanders now gets 37 percent support among voters on the left in the latest poll, released Tuesday, up 11 points from the survey last month. 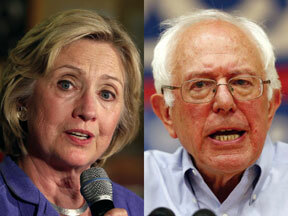 Three-quarters of the inter-views were conducted before the pair sparred over guns and their approaches to healthcare in the fourth Democratic debate Sunday night. Clinton held a 26-point advantage over Sanders last month among self-described liberals and now trails Sanders by nine points among that group in the new poll. She’s also taken a hit among female voters, from holding a 45-point advantage over Sanders last month to now holding a 19-point edge among the demographic. While Sanders has cut into Clinton’s lead nationally, the former secretary of State continues to hold substantial leads over Sanders among older voters and minorities. “With a shrinking margin, a strong showing by Sanders in Iowa and New Hampshire could cut Clinton’s national lead even more. However, he would still have to overcome Clinton’s demographic advantage in the ensuing contests,” Patrick Murray, director of the Monmouth University Polling Institute, said in a statement accompanying the poll. Former Maryland Gov. Martin O’Malley drew 2 percent support in the latest national poll. The survey of 352 registered voters was conducted Jan. 15-18 via landlines and cellphones with a margin of error of 5.2 percentage points.